It’s been a long journey. In 1975, when Dave Henderson first arrived in Amiens and started playing for the local Gothiques, the club history recalls ‘a little Canadian who barely spoke a word of French’. In 2018, after taking charge of the national team for the 346th time, Henderson retired from his position of head coach. In the 14 years that Henderson and his assistant Pierre Pousse have led Les Bleus, the country has made enormous progress. They masterminded a return to the top division for the 2008 World Championship and the country has stayed there ever since. Eleven consecutive seasons of top-flight action have brought memorable victories against some of the biggest teams in the game. In tandem, the French Ice Hockey Federation has boosted the country’s sporting infrastructure. At all levels of the game, French national teams are making progress, and last year saw Paris co-host the World Championship as the main event returned to France for the first time in the modern era. “It’s been a fun ride, most of it,” Henderson acknowledged after running down the final curtain on his time in charge of the team. Hockey in France was very different back then. Most of the national team was drawn from the domestic league, whereas the majority of players in Copenhagen are playing abroad, gaining greater experience. The local competition is also much improved. Pousse, who played under Henderson in Amiens before working with him as a coach with the French Juniors and then the national team, is expected to keep working on the French hockey program. For Henderson, there’s a slight pause – but no plans to stop working altogether. “I’ll find something to do,” he said. “I’d drive my wife nuts if I didn’t do something. For all the emotion of the final game – and a guard of honour as the French and Swiss teams applauded Henderson and Pousse off the ice – the 66-year-old is confident that this is the right step for the team. For Henderson and Pousse, who have worked in tandem since the 1990s, it’s going to be a big change. And for their players, the arrival of the legendary Philippe Bozon, the first French-trained player to reach the NHL, is something new. “Personally, I was [Henderson’s] player for nine years, and now it’s the end,” said Damien Fleury, who wore the ‘C’ as Henderson took charge of his final game. “It’s tough, but it’s hockey. I just wish them the best, and thanks for everything they did for us. 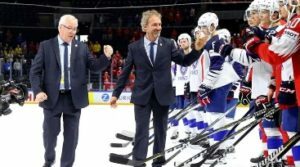 France had a great start at the 2018 IIHF Ice Hockey World Championship with long-time head coach Dave Henderson behind the bench. Today it was announced that the 66-year-old will retire as a coach after the tournament and after 14 years as head coach of “Les Bleus”. Henderson moved to France in the ‘70s to play and coach Amiens before joining the French national team program as the U20 national team coach in 1999. He took over the men’s team in the 2004/05 season and brought it back to the top division in 2007. Since 2008 France has been playing in the top division without being relegated. The best placing was in 2014 when France reached the quarter-finals and finished in 8th place – the best World Championship placing since 1953. Last year on home ice in Paris the French tightly missed out on a playoff qualification and were 9th. A successor has already been found: French hockey legend Philippe Bozon will take over and be the French national team head coach as of the upcoming season. The 51-year-old IIHF Hall of Fame member brings with him vast international experience as a player. He was the first French-trained NHL player and represented his country in four Olympic Winter Games and in 12 IIHF Ice Hockey World Championship events (including eight in the top division). After ending his career as a player with Geneva-Servette in 2006 he started to coach the junior teams of the club and coached the French U20 national team at two occasions before moving to senior pro hockey. He coached HC Lugano and HC Sierre in Switzerland before returning to France where he has been the head coach of the Bordeaux Boxers since 2016. “After more than 15 years with the national teams, French hockey can thank [Dave Henderson and Pierre Pousse] for their faithfulness and dedication,” French Ice Hockey Federation President Luc Tardif said. Bozon still has a contract in Bordeaux and the three parties involved found an agreement that will allow him to coach both teams during the upcoming season. It was a decision that would change his life. Around his 19th birthday and with his first games in the top Italian league, Andreas Bernard decided to move to junior hockey in Finland. To leave his beloved home of South Tyrol (visibly represented as the ad on the Italian jerseys here in Budapest) where he grew up and played in the town the locals call Neumarkt (also known by its Italian name of Egna elsewhere in the country). He played U20 hockey in Lappenranta close to the Russian border, had his first top-level senior league games in his second season and two years later tried his breakthrough in the second-tier league where he led Jukurit Mikkeli to the championship and was named best goaltender of the league. Two years followed as the backup for SaiPa Lappenranta before he moved to Assat Pori in 2015 where he has been the starting goalie ever since. Last season he had his statistically best season, fourth in save percentage in the Finnish Liiga. Recently he was sixth in the playoff stats. Back with the Italian national team he every year goes back to his roots and to his buddies. In the interview zone in Budapest he answers questions to reporters in his native languages of German and Italian, in English and even in Finnish. It’s not the easiest language to learn as it has no relation to his other languages and to most European languages due to its different roots. “It’s not so easy but I’ve been there for nine years, have my girlfriend and future wife there and she helped me a lot. In the meantime I can speak fluently,” Bernard said. Bernard has another year with Assat on his contract and doesn’t think about leaving Finland soon. “I like it very much in Finland. It’s very professional, it’s a bit different than in Italy. The culture is different, it’s less stressful. The mentality is different, we practise more and hard. After the season I have two or three weeks off and then it continues. In Italy you have two or three months off. That’s a big difference,” the 27-year-old said. “I adjusted to the north but I still have my South Tyrolean mentality,” he said with a smile. That means not just a hard shell but also a hard interior. 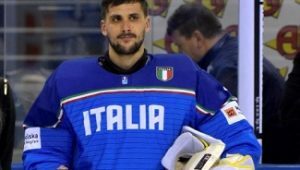 Since travelling to the 2012 IIHF Ice Hockey World Championship as emergency goalie he has joined the Italian national team every year and has become the number one in the Azzurri’s net. With a save percentage of 94.12 he’s second in the tournament behind Henrik Karlsson – the Swede-turned-Kazakh even has a 95.70 save percentage. Italy is in a group of four teams with six points right now that are still in run for promotion and also include Kazakhstan, Great Britain and Hungary. Slovenia has small mathematical chances too while Poland can’t finish in the top-two anymore. After beating Poland and losing to host Hungary, Italy got a big 3-0 win against Kazakhstan, one of its toughest competitors for promotion, also thanks to Bernard’s shutout. “It was an important win. If you look at the standings, it’s very tight, one game will make the difference in this tournament and now we’re back with six points and in first place and hope that the other teams will play for us,” Bernard said. Italy needs at least five out of six possible points in the games against Great Britain and Slovenia to reach promotion without having to look at other results. But with favourable scores in the other games that dream can also become true with less than two wins. After a day off Bernard hopes Italy will get back strong for the match-up against Great Britain. To say which two teams go up is difficult here considering the tight standings and with no team being undefeated nor winless. “Hungary has always been a difficult opponent for us. But when watching this tournament, you can see that it’s very tight. You can never underestimate Great Britain and I think Slovenia will come out stronger too,” he said. The fifth round of games will conclude with today’s Kazakhstan vs. Poland and Italy vs. Great Britain games before the final round of games tomorrow. Latest by then we will know which two teams will earn promotion to the 2019 IIHF Ice Hockey World Championship in Bratislava and Kosice, Slovakia. While the poster-boy of Croatian hockey, Borna Rendulic grabs most of the headlines, performances at the 2018 IIHF Ice Hockey World Championship Division I Group B in Kaunas has proved that there is more to their game as a new generation is making its mark. Seven on the current Croatia roster competing in Division 1B in Kaunas are part of a generation born 1995/96. One of the leading players from that crop now stamping his authority on the team is 22-year-old blueliner Ivan Puzic. His no-nonsense play with grit and determination are qualities which have stood him in good stead since leaving his native Zagreb eight years ago to fulfil his dream to make a living out of hockey. “It’s been in my head ever since I was a kid, so I went to Czech Republic on my own when I was 14 to be a professional hockey player,” said Puzic. Josef Halouzka, a Czech coach then working for KHL Mladost Zagreb utilized his contacts as Vitkovice from the steel city of Ostrava became Puzic’s next port of call. “We had been travelling from Zagreb to tournaments in Czech Republic in the past. The languages were similar so moving there was not very different compared to let’s say when Borna Rendulic went from Croatia to Finland,” he said. Instead, a world of difference opened itself up in terms of representing a big club in a hockey country with excellent facilities. “We were training twice a day and the club had two rinks inside the same arena in Vitkovice. In Croatia we had two indoor rinks in the whole country,” said Puzic. Soon tasting success and becoming Czech U18-champion with his new club, Puzic had already played for the senior team in the Champions Hockey league when he made a temporary return home to make his debut at the 2016 World Championship Division 1B. “It was great to play in my home city after being away for six years, my family was there to watch me and it was a proud moment in my career,” he said as Croatia had the chance to win bronze ahead of their final game against Lithuania before, in the end, having to settle for fourth spot. Upon his return to Czech Republic, Puzic has played a handful of games during each of the last two seasons for Vitkovice. Being an import player does not help his prospects and Puzic has spent time out on loan in the Czech second tier before in January temporarily returning back to Croatia to suit up for Medvescak in EBEL. Currently out of contract he will weigh up his options come close season. “I have some offers that I will consider after the World Championship, but having been in Czech Republic for eight years I would like to stay there,” said Puzic. A disciplined display in their opening day loss against Lithuania was then followed up by coming close to upset Japan. They then got their reward in game three when toppling Ukraine 4-2. With three points gained they are up against high-flying Estonia next, before a potential nail-biter against Romania awaits during the final day to stay in the division. “It will be tough, but we must continue to play with our heart and for Croatia,” said Puzic. Results at the 2018 IIHF Ice Hockey World Championship Division I Group B in Kaunas has so far not gone Romania’s way. Two straight defeats to Ukraine and Lithuania has stretched their winless streak to thirteen games at this level. Romania finished rock bottom in their two most recent appearances in Division IB in 2014 and 2016. A far cry from the heady days of 2012 and 2013 when they won four out of ten at this level and enjoyed two straight fourth-place finishes. A winger with many tricks up his sleeve, Fodor made his debut for Romania at the 2014 World Championship Division I Group B in Vilnius and also featured two years later as Croatia’s Zagreb hosted Division IB. Having endured the dark days at this level, he is now back on Lithuanian ice with the Romanian national team and confident that a change in fortunes is looming around the corner. “This year I think we have a better team than what we had in both Zagreb and Vilnius. We have lots of good guys coming into the team, many of them still very young so it looks good,” he said. Selected as the best forward by the Directorate when Romania last year won gold at the Division IIA, Fodor has continued his success at club level with a fruitful 2017/18 season following his return to his native Miercurea Ciuc after building up his reputation elsewhere during the last 12 years. In what is the coldest town of Romania, Fodor’s form improved as the season rolled on and he was one of the leading domestic players as SC Csikszereda from Miercurea Ciuc once again enjoyed great success. Lifting both the Romanian championship and cup this season, they also reached the semi-finals of the Austro-Hungarian-Romanian Erste Liga with a roster including many illustrious names. “My centreman this season was Andrei Taratukhin who won the Gagarin Cup and played for Russia, Pyotr Schastlivy, the former captain of Russia was on the team and there was also ex-Spartak Moscow captain Maxim Potapov, all of them good people and great players that we all learned a lot from,” he said. Fodor who is the same height as New York Rangers’ Mats Zuccarello, picked up the game at the age of four in Transylvania. His dad, Levente, had a car repair shop which the president of the local hockey club frequented and one day brought along a pair of skates for the youngster. When starting to show promise and looking to push ahead with his development, neighbouring Hungary became the next port of call. Fodor, a native Hungarian speaker uprooted to the Hungarian capital which put him on course towards a professional career. “I was 14 when I had a chance to move to Budapest, go to school there and play hockey. My family supported me, but I went there alone and it was very hard especially during the first two years. But I had hockey and playing in Hungary helped me a lot,” he said. Winning the MOL Liga (now Erste Liga) back in 2009/2010 as a 19-year-old is a memory he cherishes to this day as he got his professional career off to a flying start. “Back then I played on the fourth line where we were hard warriors who had our job to do and it was great,” he said playing on a Budapest Stars team together with many big names who contributed to lifting Hungarian hockey where it is today. “I’ve played together with Gergely Majoross, who won the Erste Liga this season as coach for MAC Budapest and is also the assistant coach of Hungary. Bence Svasznek was the captain, Balazs Kangyal was great too and all of them played many years for the Hungarian national team. I’ve learnt a lot of from them, how to prepare myself, enjoy my hockey but also how to respect it as a job,” Fodor said. Despite only being 27, Fodor is currently the third oldest player on the Romanian team skating in Div. IB in Kaunas. Despite having played nearly 100 competitive games this year, crisscrossing by bus through Romania, Hungary and Austria, Fodor is adamant that there is more than enough energy left in the tank to ensure survival at return back to winnings ways in Division IB. “We are here to stay in this division. I believe if we work together 100% we should be ok,” he said. Having turned 19 earlier this month and clearly on an ascent upwards, the Tallinn-born center and winger recently penned a two-year deal with Finnish top division team Vaasan Sport. Despite sealing a move to Finland’s Liiga, his ambitions don’t stop there. 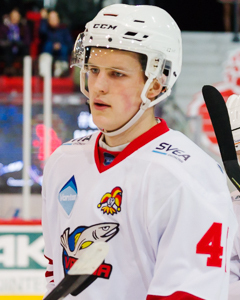 “Now I aim to get playing time with Vaasa, then I will look at my options to try and play in KHL or NHL. The main goal would be NHL,” said Arrak who is on Estonia’s second line at the 2018 IIHF Ice Hockey World Championship Division I Group B in Kaunas. Arrak’s Estonia has enjoyed a flying start to the tournament. They came out of the traps to push Japan to overtime before blanking Ukraine 2-0 in their second game. Just as the current Champions Hockey League winner Rooba was once spotted when playing against Finnish opposition as a youngster, Arrak got noticed in a similar way as an opportunity arose to continue his development across the Bay of Finland. “I was around 13-14 and I played in a tournament in Tallinn where Espoo Blues also took part. It went well for me and then came a call to ask me whether I wanted to come over and play junior hockey in Finland,” he said. From their base in the western metropolitan region of Finland’s capital Helsinki, Blues was by then starting to make a name for themselves as a fine breeding ground for promising Estonian players, Rooba had been among the players who made the jump across to Espoo and was at the club when Arrak arrived in Finland with his father in tow. “After playing four years for Blues I was then contacted by an agent on how to continue my development. We agreed on the USA where the plan was to play college hockey, but things didn’t go as planned, so I soon decided to return back to Finland instead,” said Arrak. Leaving the state of Iowa ahead of this season, he returned back to Helsinki and suited up for Jokerit’s U20 team where he quickly got up to speed again. Scoring for fun at the top level in the Finnish junior league, he was called up to Jokerit’s affiliate partner Kiekko-Vantaa to try his luck with the seniors in Finland’s second tier, Mestis. “Around Christmas time this season I was first offered to practice with Kiekko-Vantaa and it went well so I got playing with the team,” he said of an eventful 2018 so far which seen him suit up for Kiekko-Vantaa in Metsis before his raw talent caught the eye of Liiga’s Vaasan Sport. “In my opinion, he has really big potential. His development was halted a bit by his decision to go to the USHL. Since coming back ahead of this season he became the top scorer for Jokerit’s U20 and played senior hockey in Mestis and I believe that he will at least be a player in Liiga but could get even higher,” said Estonia head coach Jussi Tupamaki as he lines up Arrak’s attributes that will come to good use in years to come for the Estonian national team. “He is very versatile, able to play both as center or on the wing. He is tall and skillful but still can play a physical game but needs more kilos and power,” continued Tupamaki. Behind the emergence of Arrak, more promising signs are coming from Finland which in the near future could be benefiting the Estonian national team. Joining Arrak to Vaasan Sport for next season is 18-year-old Tallinn-born netminder Conrad Molder. Having moved to Finland in his teens to pursue his future prospects, Molder is eligible for both Estonia and Finland, but yet to feature for either country. Another player Estonia harbour high hopes for is Kristjan Kombe, a tall center hailing from Estonia’s Saaremaa island who just turned 18 and is showing good promise in HPK Hameenlinna’s U20 set-up. The lone Estonian national team player selected so far in the NHL Entry Draft was Toivo Suursoo as 283rd overall back in 1994. Narva-born Leo Komarov of the Toronto Maple Leafs was born in what today is Estonia but represents the country he was brought up in, Finland. For Arrak any talk of whether or not he one day will be mentioned in the same breath as those two appears not to face him as he wants his hockey to do the talking. “Yes, sometimes I look at my NHL-draft ranking, but my dream is not to be drafted but to actually play there one day,” said Arrak. For anyone who represents a country such as Hungary playing in the top division is a great accomplishment. Playing in two top-level World Championships during a career is a tremendous achievement and only a couple of Hungarian players have pulled off this feat, one of them being Andras Benk. “If I remember correctly my first game for the Hungarian national team was in the Ice Palace against Croatia in November of that season. The final score was 3-3, and I scored in the shootout. In those early days I remember sometimes playing in one lineup with Gabor Ocskay Jr or Krisztian Palkovics. Pat Cortina was the coach at the time and would throw me in with them. These are great memories to look back at,” remembers Andras Benk when asked about his first experience with the national team. The 30-year-old forward came along in Hungarian hockey in a peculiar time. He made his debut in the national team during the 2005/2006 season, two seasons later head coach Pat Cortina picked him to make his first World Championship, which happened to be where Hungary won promotion to the top division. The 2008 Hungarian team was made up of mostly players born between 1975 and 1980, which has become known as the golden generation in Hungarian hockey. “It is an interesting situation. 10 years have passed without me really realizing it. I really didn’t notice the turnover on the team until we played for the 90th anniversary of Hungarian hockey when I was named the captain. We faced Poland and I was the oldest player on the team. The guys that were older or more experienced than me have stepped aside or retired,” said Benk as he talked about his observation. During the season he and Janos Vas were the oldest players still carrying the torch and getting ready to pass it to the next generation of players that are breaking in and possibly the next golden generation (born between 1994-1997). Vas spent most of his career playing in the top leagues throughout Europe and North America, Benk has spent his entire career in Hungary aside from playing one year in Sweden. Benk came up through the youth system of Dunaujvaros, which produced not only Benk and Vas but other Hungarian players such as Balazs Ladanyi, Viktor Tokaji, Marton Vas, Imre Peterdi and Zoltan Hetenyi. He debuted for the senior team in the Hungarian league before moving on to spend one season in Sweden playing for the U20 team for Huddinge. Benk came back from Sweden and played for Szekesfehervar in the Austrian-based EBEL for nine seasons and has spent the past two playing for UTE in Hungary. On the international stage he has played in nine World Championship tournaments, which included two emotion-filled promotions to the top division and two appearances there in 2009 and 2016. Just since 2016 Hungary has played Italy, Austria, Slovenia, Kazakhstan, Sweden, Canada, Finland, Russia, Denmark and Korea outside of World Championship play. The goal this season of course is to win promotion back to the top division under the guidance of new head coach Jarmo Tolvanen at the 2018 IIHF Ice Hockey World Championship Division I Group A in Budapest. Two years ago, on a balmy spring evening in Croatia’s capital Zagreb, an experimental and youthful Lithuania came within a regulation time goal from winning a sensational gold at the 2016 IIHF Ice Hockey World Championships Division I Group B. With the 13,500-seater Zalgiris Arena in Kaunas now ready to open its doors for the 2018 edition of the tournament, hopes are high for Lithuania to achieve home glory and claim that much-coveted top spot. 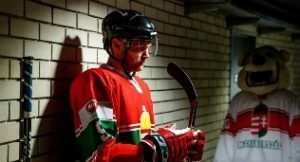 In a year when their nation celebrates 100 years since first regaining independence, the Lithuanian Ice Hockey Federation is marking the grand occasion in high spirits. With the Lithuanian roster being labelled as ‘dream team’ and the faces of Dainius Zubrus, Mantas Armalis, Nerijus Alisauskas, Tadas Kumeliauskas and the 45-year-old debutant Darius Kasparaitis adorning the posters promoting the event, Lithuania certainly hasn’t shied away from raising the expectations. Boosted by impressive ticket sales it is now up for the big-name players to rise up to the occasion in front of a home support expected to beat the average attendance of 6,032 dating back from four years ago when Lithuania’s capital Vilnius hosted the tournament. “This is the biggest sporting event in the Baltics this year and held in the largest sports arena in the region. If everything goes right we look to finish first. There is no question about this unless we get a lot of injuries,” said Lithuania’s head coach Haake ahead of a festival of hockey awaiting in the country’s second city as Estonia, Croatia, Japan, Romania and Ukraine awaits between 22-28 April. Optimistic while still doing his bit to keep a lid on expectations, the man Lithuania puts their faith in to guide them up the promised land of Division IA comes with vast experience within a game he first picked up on frozen lakes in Western Germany in the 1950s. Bielefeld-born Haake’s international coaching career started as a 28-year-old assistant coach of what was then West Germany’s U18 national team at a European Championship in France 1974. After spending an eye-opening 18 months in Canada where he also first got to know Lithuania’s current assistant coach George Kingston, Haake returned to Europe where his first international appointment was as assistant coach when Spain’s senior national team made its IIHF World Championship debut in 1977. With an eclectic coaching resume that includes working for Windhoek Cazadores in Namibia, Australia’s Sydney Allstars, Portogalete in Spain to that of winning the Italian league as head coach of Bolzano and assistant coach of top-level German teams Kolner Haie and Iserlohn Roosters, Haake has never shied away from relishing a challenge which seen him coach on four different continents. The opportunity to acquaint himself with Lithuanian hockey arose when the affable Haake struck up a conversation with the President of the Lithuanian Ice Hockey Federation, Petras Nauseda, in Helsinki during the 2012 IIHF Ice Hockey World Championship. Fresh from having staved off relegation at the 2012 World Championships Division I Group B, Lithuania was then in the hunt for a new head coach to replace Sergei Borisov. They found their match in Haake, who jumped at the opportunity to try and reverse the waning fortunes of a national team that in 2006 had been one victory away from winning a place at the top-division of the World Championship. “I became the first coach from a western country to coach Lithuania’s national team. In the past, they always had coaches from Russia, Belarus or Latvia. My first World Championship was in Donetsk 2013 and this is now my sixth year,” said Haake who also during three of those seasons worked as assistant coach of Lithuania’s U20 national team as well as the country’s top club Energija Elektrenai. While greatly admiring the hard graft put in by the growing Lithuanian hockey community with its limited resources, he also readily points out some of the challenges he feels is holding back further progress in the Baltic nation. “When you have the power you don’t want to lose it. To translate this into Lithuanian context, teams are not cooperating at youth hockey level and instead look after their own interests. We need strong teams from U12 to U18 level and have them come together once a month to play in tournaments, but it is not possible. We should look at Slovenia and what they do with their resources. Instead in Lithuania, we now have three to five good players in each team, but as they are not being challenged their level is now going down instead of up between the ages of 12-16,” said Haake, who also has started to feel the effect of this in certain positions at a national team level. “The problem for Lithuanian hockey for the near the future is that we don’t have defencemen. We have the four veterans, Kasparaitis, Rolandas Aliukonis, Arturas Katulis and Mindaugas Kieras, all of them over 35. For the young players to continue their development they have to go abroad but it is not easy as a Lithuanian player to find a team to play for,” said Haake, who hopes the star-studded roster and wins out on the ice can add exposure to the Lithuanian game at home and beyond. “People in Lithuania like hockey. We saw that already at the 2014 World Championships in Vilnius. This time around we will be helped by Kasparaitis who is playing for his own country for the very first time at a World Championship. Born 1972, like (Jaromir) Jagr, he is on the ice three times a week during the season, he played for us already in November and he is still in unbelievable good shape,” said Haake, who also has high hopes for another troika of big-name returnees ready to turn on a show in front of their home audience and offer that extra bit of edge that got them so tantalisingly close of getting their hands on the gold medals two years ago. “Zubrus plays with together with Kasparaitis during the season in Miami and just as in 2014 he will be very good for us. Armalis is back in goal after two years and for the first time in many years, Tadas Kumeliauskas will play for us, so it looks like we will have a strong team,” said a hopeful Haake. 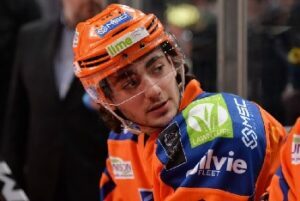 For several months now teenager Liam Kirk has had to deal with being British ice hockey’s great hope. Since the turn of the year interest in the 18-year-old Sheffield Steelers’ forward has intensified from teams in the National Hockey League, the world’s premier competition. Scouts from more than 20 NHL teams have taken the time to follow up word-of-mouth recommendations and video of the Rotherham-born forward in action. They made the trip to the UK to see first-hand what all the talk is about to report back to their bosses in North America. Clearly there is significant interest in his future. On Thursday Kirk was informed that he was being extended an invitation to the NHL’s annual Scouting Combine event in Buffalo, New York, in May. There Kirk will have the opportunity to talk with all 31 teams as well as go through a series of rigorous skill and physical tests from which the teams will then take the information to inform their decision-making when it comes to the NHL Entry Draft event in Dallas on June 22-23. Steelers coach Paul Thompson says he will be “flabbergasted” if Kirk – ranked as a ‘C’ Prospect, thereby placing him in the fourth, fifth and sixth round of picks – is not drafted. Should he find himself as one of the chosen ones and subsequently go on to play in the NHL – or ‘The Show’ as it is often referred to – it will make Kirk the first British-born and British- trained player to do so. Other British-born players have played in the NHL over the years, but they have largely done so after their training and development took place outside of the UK. In recent memory, Tony Hand and Colin Shields were two British-born and trained players to be drafted although neither made it through to the top. Therefore being drafted does not guarantee anything, as a number of Kirk’s current Steelers’ team-mates will testify, but there is a clear determination in the youngster to seize the opportunity he has in front of him, with one aim being a role model for other British youngsters playing what is, for many in the UK, a minority sport. Every year British youngsters head away from the UK to improve their game, either to Europe or North America. But Kirk, despite opportunities to go abroad, has remained in Britain, his performances for GB junior teams first bringing him to the attention of Thompson at Sheffield. After a week’s training with the Steelers, Thompson knew he wanted to sign up Kirk, along with fellow teenage prospect Cole Shudra. Both were given three-year apprenticeships – this season being joined by Bradford-born forward Kieran Brown on a similar deal – and it is Kirk who has emerged the quickest, with the Steelers resigned to seeing the youngster continue his career and hockey education elsewhere, most probably in North America. For Kirk, the speculation and headlines that have followed him around in recent months are something he has taken in his stride. “When you’re a kid from Britain playing hockey people laugh at you if you mention the idea of playing in the NHL, or even getting drafted,” said Kirk, who has had conversations in recent weeks with representatives from the Chicago Blackhawks, the San Jose Sharks, the Detroit Red Wings and the Edmonton Oilers, among others. “So all I’ve done is try to keep improving in the hope of making it a reality. Everybody has dreams and that is one of mine. “It’s the same for a kid starting out playing football, they want to play in the Premier League – it’s no different for me as a hockey player. “It is a dream of mine, but I don’t see it as pressure, just an exciting opportunity. I’ve just got to keep playing hockey. Kirk’s progression is something of which Thompson is rightly proud and, although the youngster’s intended three-year apprenticeship will essentially remain incomplete, the former GB head coach insists Kirk is fully deserving of his opportunity. “Since the turn of the year Liam really has elevated his game to another level,” said Thompson. “He’s been fantastic, every time he’s on the ice there is something happening – he’s using his speed and all his skill – and he is, without doubt, one of our top forwards right now. This season Kirk has posted 16 points in 59 appearances, nine of them goals. But it is not just the production from one so young in a senior league that has brought him to the attention of team bosses in North America; it is more his mature, skilful performances. NHL director of central scouting Dan Marr believes that Kirk’s achievement in creating a regular spot on the Steelers’ roster this season, with his ice time increasing as the season has progressed, has made him a player worth investigating further. Essentially, it is the job of Marr and his staff to compile the Entry Draft List and tell clubs which players they are going to be recommending, leaving it up to the team bosses to decide who they wish to look at in more depth. “There have been a number of clubs who have gone over to watch him play,” said Marr, “and what he has shown is that he has got some very natural instincts for the game – he’s always able to read the play and be in the right place at the right time. That type of hockey sense is hard to teach. “He’s also got very good awareness with his vision which, again, is down to his hockey sense. Marr said Kirk would get a further chance to impress NHL teams at the Scouting Combine prior to the draft, but said his performances for the GB national team at next month’s World Championships would also provide him with a chance to shine. “There will be a lot of scouts attending that event to see him play,” added Marr. “Any exposure he gets by playing with the GB national team is a feather in the cap for any 18-year-old. “What makes Liam unique is that he is doing it in a non-traditional hockey market, as far as a market where NHL prospects are scouted. “Liam seems to really have a passion for the game and is doing what it takes to get to where he’s hopefully going to thrive at it one day. “I think he’s very excited that he could be somebody who hails from Great Britain and goes on to play in the NHL.